Agile Elephant recently ran a workshop at the #responsiveorg unconference in London entitled: “The History, Biology, Anthropology and Psychology of a Responsive Organisation”. Much of the content stems from background research that we’re doing on what the future of work/organisational structure will look like. 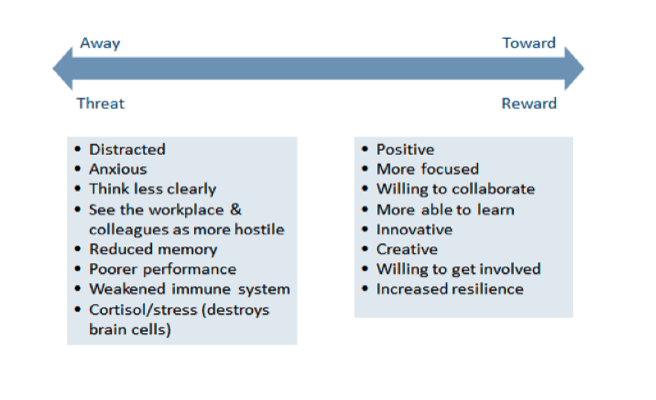 All 4 are intrinsically linked but my research is focussed on the psychology – and more specifically on the latest research in neuroscience and its potential impact on employee engagement which is one of the key facets of a responsive organisation. Increasingly companies like BT and Volvo are using the findings from neuroscience to help improve Learning and Development efficiency and effectiveness and also assist HR who are able to use the findings (check out this recent CIPD report). With the advancement in technology fMRI scanners are helping us understand exactly how our brains are wired. 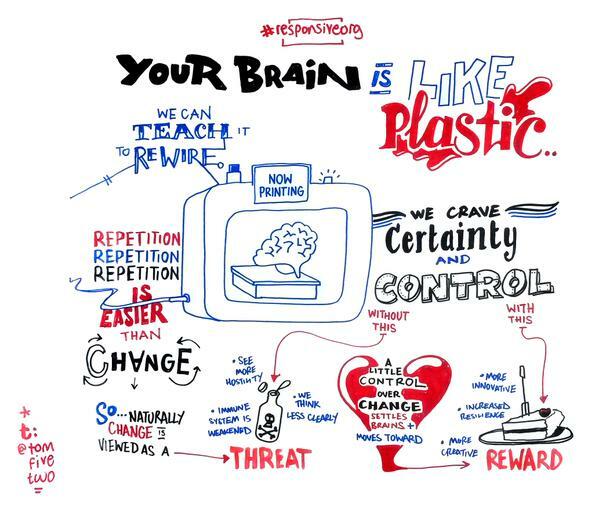 It transpires that our brains are actually plastic – learning can change the function, connectivity and even the structure of your brain. We can help our brains rewire and work differently. On top of this we now also understand more about the effect of different hormones (such as the fight or flight hormone adrenaline or the stress hormone cortisol) within the brain. We’re learning how this all works together and what the impacts on the way we work are and what helps us work optimally. The above diagram by Hilary Scarlett ‘Neuroscience and the 4 enablers‘ of Engage for Success clearly shows what is needed to ensure that employees feel engaged (on the right). Hilary explains how the brain is organised to avoid threat (on the left) and find reward (on the right) – but our evolution dictates that avoiding threats is more important. If there are threats in the way we can’t be in a positive (and engaged) state until the threats are resolved. To achieve the ‘Reward’ state our brains crave certainty and control. We naturally rely on past experiences because this uses less energy than having to think about what could possibly happen in the future (brains use a lot of energy so the body seeks to minimise it with short cuts). Our brains like predictability and certainty – repetition is easier than change. Any change in our environment means that we can’t easily predict things. Change thus means having no real certainty or control and we are more inclined to feel more in the ‘threat’ state because of this. We can’t easily think or perform well and we can view the workplace as more hostile than it actually is. So what does this mean for companies and employee engagement? When going through change it can help enormously if companies have a clear and open strategic narrative explaining to people where they are heading, which enables employees to feel that they can at least predict more easily how this will affect them, and give them some form or certainty. Neuroscience has shown how we also crave control and having a sense of control does have a major impact on reducing stress. No control leads to higher levels of the stress hormone cortisol which kills and damages brain cells (particularly those which play an important role in memory). But not just that. As Hilary says “Leaders need to know that when we feel we have no control, we see the same situation as much more stressful. Even a subtle perception of autonomy (control) can make a very significant positive impact on our brain’s perception of events”. We feel less threatened. It’s often just the small actions and gestures that can put our brain in a positive state – making eye contact, listening to people – generally ‘engaging’. These are the things which cost nothing, take very little time but can have a huge impact by helping move people into the positive mindset. It’s not just neuroscience which is showing the value of these small gestures either. Google (who are the only corporation in the world relying on data-driven human resources functions alone) have pinpointed via their Project Oxygen that the most important activity for management success includes holding regular one-on-ones and ‘listening’. It does however give me one thought – once we have analysed every possible nuance and activity in our brains, will we really be happier once we have demystified all its mysteries? In fact it could raise the question “what now is our Soul”? Many thanks to @tomfivetwo for the above scribing at the #responsiveorg workshop.